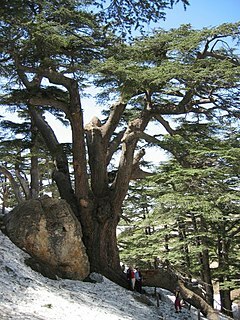 Lebanon Cedar in the Forest of the Cedars of God. The Cedar of Lebanon is a large coniferous tree of the cedrus genus, it is native to the eastern Mediterranean Sea from Lebanon to Turkey. The tree grows to a maximum height of 40m and 10m wide, with a trunk of 2.5m covered in thick, scaly, black, grey-brown bark. When young it is conical in shape but as it matures it becomes flatter on top and more open in structure. The pointed, needle-shaped leaves are glaucous-blue to dark green in colour, 4 sided and about 2.5 cm long. The female cones are a dullish green when young, maturing to brown, 6–10 cm long and barrel-shaped. The Cedar of Lebanon has great landscaping value and is widely planted in park and large gardens.